Drawing and painting figures is always fascinating, whether to include in a landscape painting, as subjects in themselves, or in a fantasy context as you will see below. Life drawing is easily the best way of learning to draw the figure, though this may hardly be necessary if you are simply wishing to add a few tiny figures into a wide open landscape. I love drawing figures, especially action ones, really doing something interesting, and much of the time these tend to be humorous. 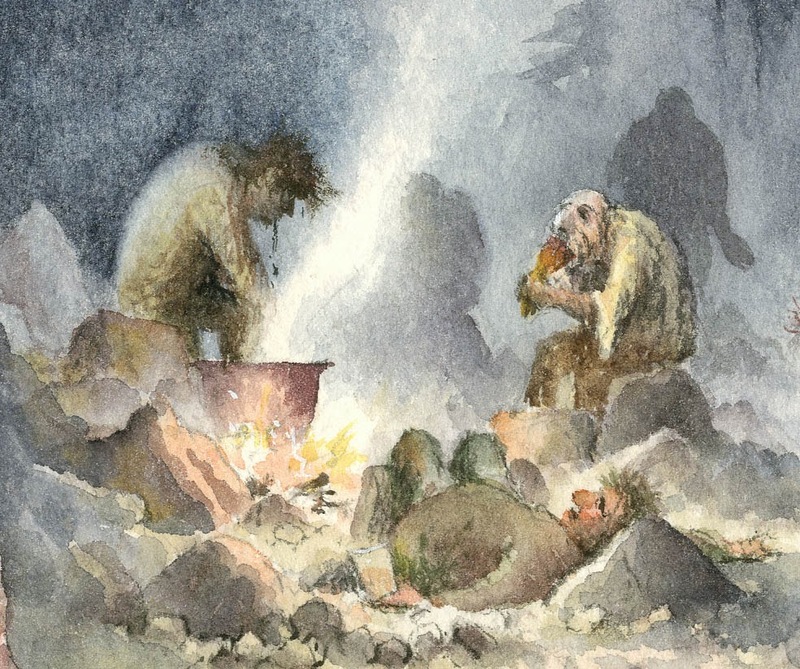 This is a small part of one of the illustrations from my children’s book Terror of the Trolls, where several trolls are gorging themselves – one is eating a leg of some sort, the one on the left is warming his feet in the soup, and the third is flat out after a heavy drinking session. Getting people to pose for these activities was not a real problem, though some of the more gymnastic poses in other parts of the book did rather leave me scratching my head! Note here how you cannot see the whole body of any one troll, and this makes it look more natural, especially in non-fantasy situations. Try to have your figures relating to each other, and not there just to ‘fill the gap’. Back-ground figures can remain as silhouettes, thus throwing the emphasis more onto the main figures. Last night Jenny and I enjoyed the Erwood Station Craft Centre Christmas Party, where the lovely Lorraine King entertained us with her wonderful repertoire of songs. It was a wild night (outside! ), and in addition to the bridge being closed, three other roads were cut off by fallen trees, so it was a wonder that so many folk attended, having hiked over hill and vale or probably coracled across the Wye. Nothing stops the Erwood Station Stompers! It closes for Christmas and re-opens on 14th February. This entry was posted in atmosphere, David Bellamy, Painting Figures and tagged atmosphere, fantasy art, painting figures by David Bellamy. Bookmark the permalink. posted over the past 12 months, receiving them is very inspiring and makes me want to get my watercolours or pastels out. To you both all the very best of everything in the coming new year.